I put this here because it was suggested that this might really bring out some most interesting and incredible pictures along with the stories behind them. I know there should be a lot of Hondas, but there were alot of Other Bikes also (hence the reason It was suggested to place this Topic here. I hope ALL will feel free to share the pictures (& the stories behind them) with us as I feel that we owe a lot to those folks And The Bikes. If it hadn't been for my Grandfather and my Dad, I probably wouldn't have been so Into them myself. There are some really great pictures and stories in the thread I posted over in the "Open Forums" and I'm no wanting to slight them in any way, they should be remembered as well. I hope this will be kept going and be contributed to freely. My Uncle Howard 1916-2002 - picture taken at Aldershot, England in 1943. A gifted story teller and a great guy. I miss him. 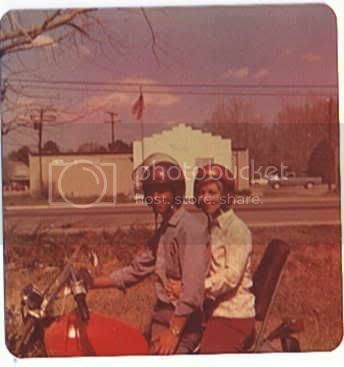 I can't find a picture but I had bought a 1965 Ducati Street Scrambler from a fellow that had gotten his girlfriend into a situation. He wanted to make it into a chopper. What I bought for $100 was a Frankenbike. No speedo, no turn signals, no horn, one mirror, and a kill switch. He also sawed off the muffler. The neighbors complained, so I had to roll it down the hill before I started it. To pass inspection I took a bicycle squeeze horn and clamped it to the bars. I rode that ugly little bike through woods, highways, and rode it to Woodstock. It was waiting for me when I got back from overseas and started right up. It finally wound up in the back of the old mans garage after I got married. I rebuilt the motor and drove it through the gas crisis and finally he gave it to some guy I knew and that was that. It was ugly, dangerous, underpowered along with a hundred other things. I miss it dearly. I think I've posted this picture before but, I wanted to tell the story behind it. My grandfather decided to start a motorcycle shop after spending a good amount of time repairing them for others, in the family gas station/garage/blacksmith's shop (my Uncle Henry did most of the blacksmith work). So he and a friend went out in the countryside, knocking on doors and asking about any motorcycles that they might want to get rid of. Now my Grandfather wasn't too well off moneywise and his transportation t bring the motorcycles back to his place was and old Indian Chief with a sidecar (with out a body on the frame) and haul them back on it. He got some for little of nothing and some just for hauling them off. When they'd get back to the shop, the decision was made whether to part them out or fix them to sell. This was started in 1932 and as soon as my Dad was old enough, he came into the business and it became "Van Pelt & Son Indian Motorcycle Sales & Service". 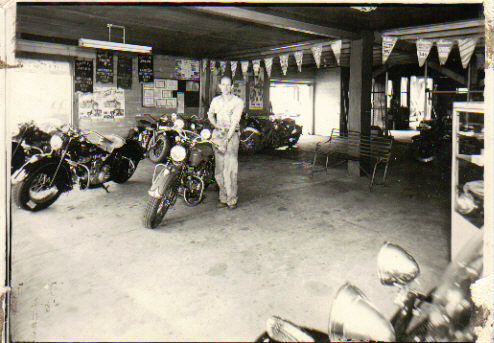 Now here's a picture of My Grandfather on his showroom floor with some New 1947 Indian Chiefs. 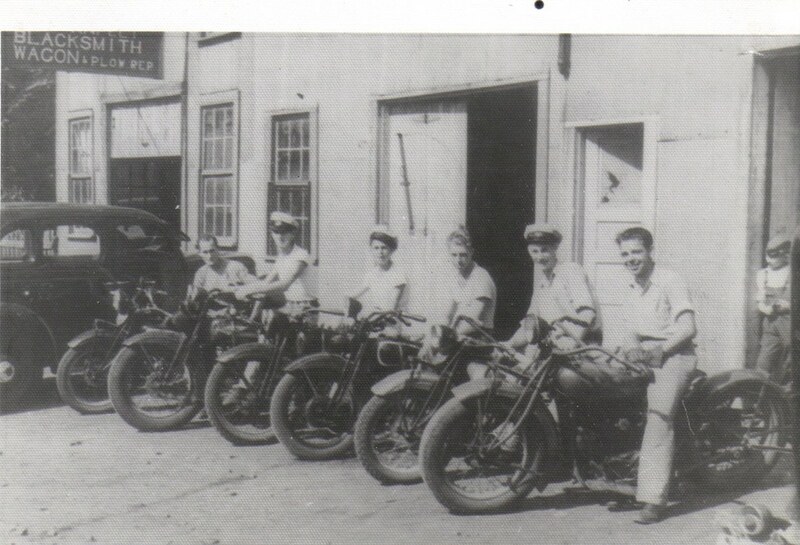 Here's another with my Dad and a few others, on their bikes. There's nothing on the back of the picture that tells who they ALL are or the models of the motorcycles. I do know that, at one time my Grandfather had a 39' Indian Chief and my Dad had an Indian Scout that I think was a 29' or 30' model and I'll bet that these are those particular motorcycles. And I learned something about this when I scanned and saved this picture. I never actually knew or thought about what the name of my Uncle Henry's business was, until now. It was Van Pelt's Blacksmith Wagon & Plow Repair. I almost forgot to say that my Grandfather is the first one on the left (as we're looking at the picture) and my Dad is the next to the last one on the right (with a motorcycle hat on). My dad on his 450?? with my aunt and my cousin. 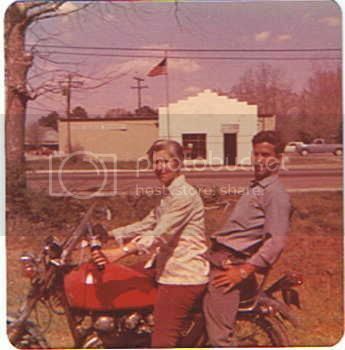 There were other pics of my dad on his bikes floating around, but I can't put my hands on them right now. When I came along, my mom made my dad get rid of the bikes. When I was growing up, I had a Honda 50 trailrider that I rode all the time. People brought bikes to dad for him to work on them, but my mom didn't want him to ride. When I turned 18, I drug home a Kawasaki 440 LTD... and a box of parts... That pissed mom off to high hell and back. Dad passed away in 1998. The rides we shared still live on as I ride CASSANDRA, Dad's old 550. I sold the Kawasaki when I put dad's bike on the road. I grew up with bikes. I rode from the time that I walked good. It's just in my blood to want to ride, and it's my pleasure to keep a rolling memorial for my dad. I am likely to post more pics of my dad's old bikes as I run across them. Well at the moment i dont have pictures reguarding my earlier past with motorcycles however ironicly enough It started with a small honda off road bike. Still not sure of the model hell it may have been a street bike i was thrashing in the fields back then. But the bike that started it all for me street bike wise was an old CB750..if i remember right it was a K8...It was in very rough shape and i had the chance to buy it for something like $200 but this was back when i was 14 so that sort of money was hard to come by. a couple years later my first official street bike was a 93 Honda CBR 900 RR that i bought for $1500 along with a couple truck loads of spare parts and a 92 Kawasaki Ninja 750 that was fightered. It was a package deal that someone was selling because they were getting out of track racing the CBR. I returned the CBR back to street form using parts in the stash and rode it from the time i was 16 till i was 18. That bike and the ninja were sold off when someone that ment a lot to me passed away in an accident...she had a hand in the CBR being returned back to street form hence too many memories to hang onto it. Bought an 02 Yamaha R1 and rode it for about 4 months moistly due to having an accident with a friends R6. Sold the R1..which wound up totaled by the kid who bought it. this was back in 02 Fast forward to 06..which lead me to saving a a CB750K4 from a friends garage...unfortunitly as all of you know that bike never seen the street as a CB ever again. The K4s engine is sitting in the chassis of a drag bike turned chopper. also about a month after i got the CB i found my Interceptor sitting in the dealerships upstairs storage room. I still remember the day i brought Shadow home. When we brought it down from upstairs on the lift i felt like a racer unloading a bike from the transporter. Everytime i hear that V4 fire up and sing its distinctive note that feeling is reborn...i never felt like that with the RR the 900 felt like a tool..a means to get somewhere...the VF i enjoy riding...hearing that engine spin over up to 10000 Rpm and settle into a roar that was once heard on race tracks back in the 80s. Sure i ride with a bunch of sport bike riders now...but even when we are out in group formation flyin down a stretch of pavement my ears focus on the hearing of two or 3 bikes that are usually in the group..my VF..a buddies VTR 1000 and another VF1000F. I have watched onlookers kinda idly watch the rockets fly past then instantly lock on and watch the V powered bikes. Between the inlines and the V bikes flyin past at speed it creates an unholy roar that one would think they were on the sidelines of a race track not just watching on the streets. I know once i start riding the other bikes in the collection im going to fade within the group unless on the VFs or the Triples. Hey Chris, Ramblin' on is what this is all about. All the Ramblin' on this one and the other on in the Open Forum, is really bringing in some good stuff and I'm lovin' every bit of it. My Mom used to refer to me as being part motorcycle, part car and part human (maybe ). Well actually, i just threw in the human part. She never said that! you see, I was always talking motorcycles or cars and she used to get so tired of that, when I was younger (in my teenage years). She's been gone about 5 and a half years now. That just kinda slipped out, you see, she would have been 79yrs old on the 19th of this month and I get this way this time every year. How old do these pictures have to be? Here's one of our "SOHC Racing Stable" in 1979. We all shared a house that belonged to the University of Sussex - guess what; we were all engineering students! Steve, Like as it's been said about "Beauty is in the eye of the beholder". Well, the same goes for the pictures, if it's old to you then it that's all that matters. I remember seeing yours before and I think those bikes look great withe fairings. So, to all, "If You Have Pictures, Post Em'!" Pictures memories! Hope, That is an Awesome tribute. Got to agree, I know the closeness you feel when even around Cassandra. My Dad's 82 and not in real good health and the closest I've got to having one of his bikes, is the 77' SOHC4 CB750A that he bought a couple of years ago to fix up and "get back into motorcycling" with. I do have the little Jawa 50 that he fixed up for me as my first bike though. I hope you & Cassandra have LOTS of time together! Gandpa is on a 31 and Dad on a 30 or earlier. #6 I cant see much of... fender looks Indian , cant see the forks. I rt clicked but donrt know what to do?? After you right click on the picture, click on "View The Image"and it should show the entire picture then. If THAT doesn't help, I don't know what to tell you and someone with more than I know, will have to assist you. At any rate, the 6th bike IS an Indian and appears to be the same as my Dad's. It's got the fork with the leaf springs that look like they were cut in half. Seems like you've got a pretty good knowledge of the old Indians & H-Ds. Just got a scanner so I thought I'd try it out. Here's me, proud as I could be, in 1974, with my brand new CB250G5. Fast forward to 1981 with me on the first XT500 I owned. That's my eldest son Jon up front, age 2. Ah happy memories. The CB went down the road, a victim of slippery roads, Japanese 'concrete' tyres, and a bit too much exuberance on a bend. I patched it up and traded it off on my first dual purpose bike, a TS125. The XT was sold to help finance a return move back to England from Canada. Hey Nick, Cool pictures you posted. 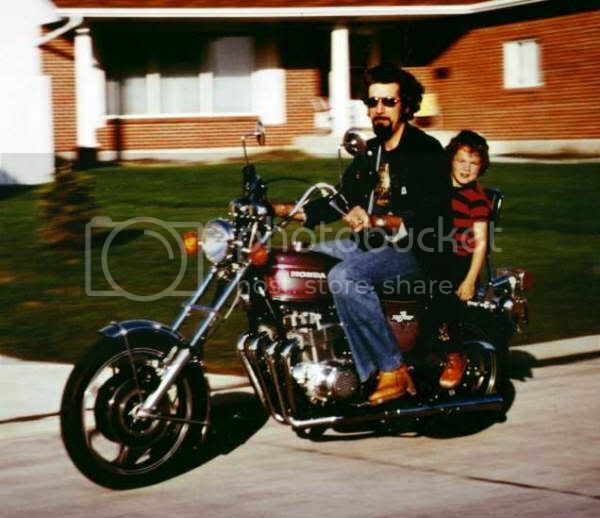 That picture of you and your 2yr old son reminds me of the time I was working on a Yamaha XS360 (bike wasn't too old at that time) and I put a helmet on my daughter (don't remember how old she was then, just that she was small) and took her for a ride on the gas tank (like you did and MY Dad did with me many years ago) and she sure enjoyed it! One of our friends saw me with Karla on the 360 with me and she raised Holy Hell about it and asked if my wife knew that Karla was on it with me (Of course she did) and she called my wife to complain. Wife just brushed her off. 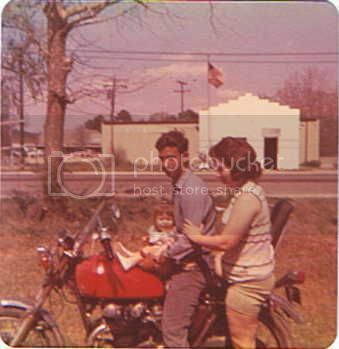 Hey all, I found this old picture of my mom sitting on the neighbors bike in 74 or 75 I was born in 75 and now 32 years I get a 75 cb550 that was originally the color of the one in the picture. I'm not sure if the one in the picture is a 550 or a 750 though. Any guesses. How crazy would it be if it was the same bike. Well needless to say, mine looks totally different now. I'm not sure if the one in the picture is a 550 or a 750 though. Definately not a 750. It actually looks like the tank on the first 500's. The 74 550k had that tank. May very well be a 74 550. The 75 had the tank like mine's got. This is me on the back end of my uncle's CB750. Lots of neat work done to the bike as you can see. My father was dead-set against bikes, but my uncle never lost his interest. He went through a variety of bikes, settling on Ducati as the brand of choice at one point having at least 5 of them, including the venerable GT750. His 6'4" stature, age and bad back forced the transition to a Harley Road King a few years back, with most of the Ducati collection sold off. He kept an 860GT around and restored it with one of his sons. Took me a while to get my own bike, waiting more than 20 years after the photo was taken back in 1975 or so. tintin, that was a cool post and picture. That's what it's all about and all those who have posted here and who will post here, they will be shared and appreciated. This is a really cool thread!